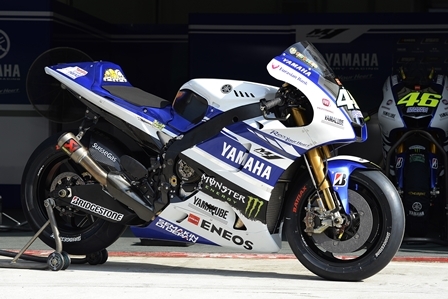 After a long winter wait the Yamaha Factory Racing riders were finally back on track today for the first official ride of the 2014 season at the Sepang International circuit in Malaysia. The first day of the three-day IRTA test gave riders Jorge Lorenzo and Valentino Rossi a chance to blow off the cobwebs and stretch their muscles on a bike again as they worked through a number of test items for the 2014 YZR-M1. Rossi, the first Factory rider to venture out on track, was also the first to find a quicker pace on his M1, slotting quickly into the top three and leading briefly before the lunch break. As the afternoon session continued the Italian was joined by his teammate Lorenzo who moved up into second, just 0.3 off front man Marc Marquez. A flurry of fast laps towards the end of the session re-shuffled the pack a little, Rossi ending the day in second, 0.518 from the top and Lorenzo in fourth, 0.796 seconds from first. The Yamaha Factory riders were enjoying their 2014 bikes in full livery, featuring recently announced sponsors Eurasian Bank, Fiat Professional and SuisseGas. The bikes also had a special sticker stating ‘Yamaha Lends a Hand to Yolanda Victims’ to promote Yamaha’s campaign to support victims of the typhoon in the Philippines. The day’s testing was followed by a special press conference hosted by Yamaha Motor, introducing Yamaha’s Global 2014 Racing Program. The event was also attended by Takaaki Kimura, Senior Managing Executive Officer and Representative Director of Yamaha Motor Co., Ltd.